2016 Edit - This looks to have since been discontinued at McDonald's Turkey. At the time of writing in 2012 it was still on the regular menu. After flying into IST from CPH, I quickly hit up the Turkish Airlines lounge (which is pretty great), had a shower, a couple cups of Turkish coffee, loads of fruit, and headed out into the city to go exploring for the next 20 hours. I had spent most of the morning exploring the old city and though I had walked past the Sultanahmet branch of McDonald's (which was the only one I saw in the Old City) a couple of times, I decided to go in slightly after the lunch rush. As is normally the case, I saw a few items being promoted that weren’t on the website: a Kiwi Smoothie, and a ‘Browni Intense’ McFlurry. I even debated trying one of the ‘Böğürtlen’ McFlurries as even the cashier couldn’t tell me what it was, Google Translate later told me it’s just Blackberry (which I’ve had previously in China). Though promotional items, I passed on these dessert items because I just had a special McFlurry in Denmark the evening before. 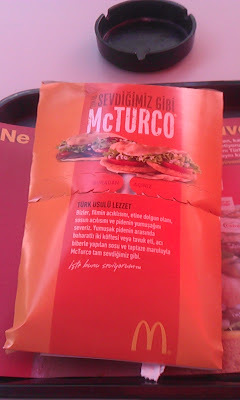 What I did end up deciding on was the ‘McTurko Chicken’, being similar to a kebab, it was the most unique thing on the menu. 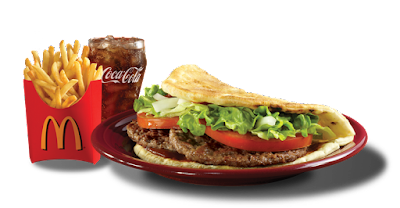 The reason why I was hesitant to choose this was because it was similar to the ‘Chicken Foldover’ which I had in Malaysia back in 2005 (and which I have since learned is a Ramadan promo item) and Lebanon in 2007. 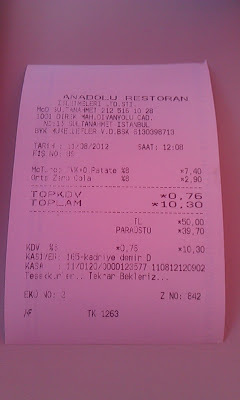 Everything in Istanbul was slightly more expensive than I expected it to be, and at 10.30TRY (~$5.70USD) for the combo, which I thought was a little pricey. It was packaged in its own unique tearable box. You tear off the top half, and use the bottom to hold it. Inside the tearable box, the sandwich was wrapped with another piece of wax paper, which made the bottom difficult to eat, and I ended up just using my fingers for the last 2 bites. The restaurant had a nice mix of tourists and locals, and though the interior seating area was pretty full with locals there was a quiet outdoor seating area that was only accessible for McDonald’s customers. Though the branch was on a busy street, this seating area was behind the building, shielding it from the noise. 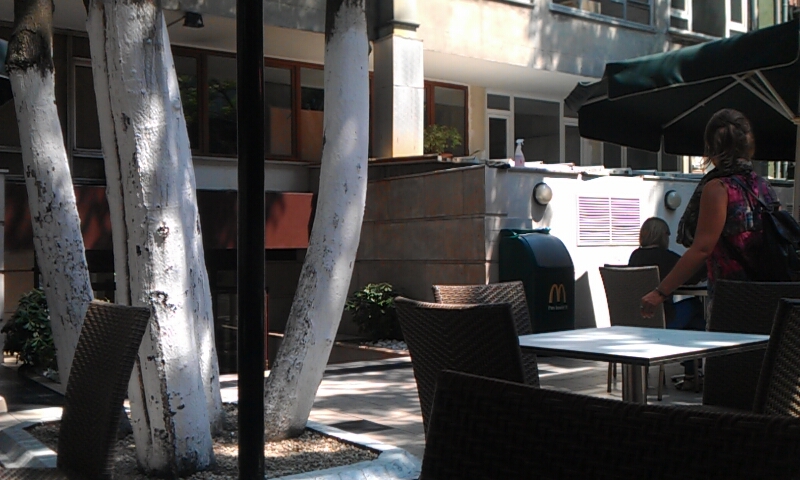 The trees and sunshine gave it a nice atmosphere that I haven’t had at other branches. In Turkey, you had the option of having Beef or Chicken, and I chose chicken because I had beef in Malaysia and Lebanon, though when I found out that it was breaded and fried chicken, I regretted not choosing beef. I think the McTurko would have worked a lot better with grilled Chicken, McDonald’s in Turkey does offer a Grilled Chicken Burger, and it’s even served on a whole wheat bun (same as Denmark), so it must be cost cutting reasons why they do not offer it in the wrap. 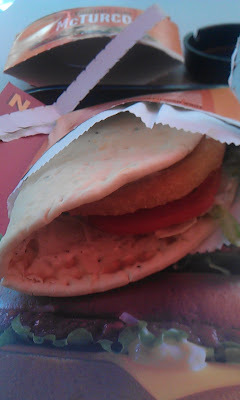 When I ordered, I assumed it would had a thin bread (similar to Pita), which was the case in Malaysia and Lebanon. But the bread was thick, soft, and hearty, that you needed to have a lot of filling inside or else all you would taste would be bread, and it did not disappoint. Not only did it have two full size chicken patties, but it also had a decent filling of large tomato pieces and copious amounts of lettuce. Long time readers know that I don’t like it when my sandwich has too much sauce on it, but this had just the right amount of the tangy, slightly garlicky (similar to Tzatziki) sauce. All in, the only disappointment I had with it was that it was lukewarm, if the bread would have been served piping hot, it would have been great. Another point was that the website states a Chicken Turko, with medium fries, and Coke Zero, would be only 820kcal. 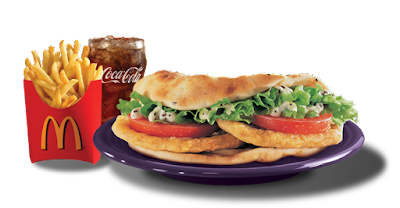 If the fries make up ~350kcal, (and naturally, Coke Zero having 0kcal) that leaves ~470kcal for the sandwich, which I find hard to believe with the sheer amount of bread and the two fried chicken patties in the sandwich ,I think it would be closer to ~600kcal. Looks like the beef used a "spicy tomato" sauce over the yogurt sauce found on the Chicken.